What a great day! This was one of the most fun days we had on our trip five years ago, but today was even better. For one thing, the wind finally shifted to the west, which meant it was giving us a good push all day long. That went a long way toward making me feel as though I’m finally getting stronger and riding better, although my aching knees this evening tell a slightly different story. My alarm went off at 5:00 am because we planned to head off for breakfast around 6:00. It takes me about an hour to get everything together each morning and figure out how to get it all back into the Pac Tour bag. Plus, there were the last ten minutes of this classic Twilight Zone episode with one of the Darrens from Bewitched, you know, the one who was also in the movie about the Scopes trial. Honestly, I was just trying to find the Weather Channel. 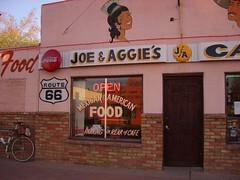 Anurang and I rode the three quarters of a mile down the road to Joe and Aggie’s, where we had a fair breakfast but enjoyed great service. Although I ate French toast, two eggs, and two good-sized sausage patties (and a banana when I first got up in my wigwam), I was still hungry all morning long. Rollout was at 7:30, and the wind was helpful right off the bat. We started toward the back of the pack and enjoyed the easy pedaling after a longish shallow climb out of town. After four miles, we had to get on the interstate. Lon got a bit irked when some riders ahead of us skipped the first option at mile 18, which was actually a very nice frontage road. It did dead end at a junkyard though, where we had to jump a fence to get back onto I-40. The fence wasn’t too bad, but the “goathead” thorns all around it were nasty. After a few more miles we got off the interstate again at the exit for Petrified Forest National Park, which also was our first rest stop. The next dirt option starts inside the Park ($5 per bike entry fee) and is one of the highlights of the whole trip, in my opinion. There is still old pavement, but there is also a lot of sand. Very quickly, you find yourself in what seems like the middle of nowhere. It’s hard to believe that thousands of cars used to travel this route until you step a few feet into the desert and see all the old tin cans. 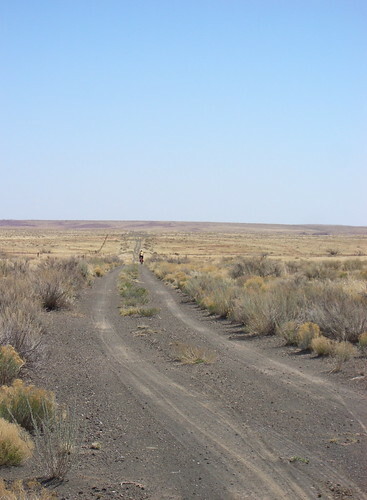 This is also one of the longer “off-road” options, lasting about 12 or 13 miles. We tried to stay in small groups as that made it easier to get over the few fences that we had to hop along the way. I concentrated on trying to relax and let my bike find its way through the sandy bits. It’s still a little unnerving when I feel the wheels slipping beneath me, but so far so good. I found some reading glasses on the road and stopped to scoop them up, figuring there was a good chance they belonged to one of our riders. We have a lot of people on this tour who need reading glasses, yours truly included, although I’m fortunate that I can still read Pac Tour route sheets without them. When we got to Gallup, I found out that they belonged to Gerd. A few more miles on the interstate took us to yet another nice frontage road. Frankly, I think old frontage roads are nice when you have a ripping tail wind. Even the interstate is nice under those circumstances. Lunch was at the Sanders Diner, which is an original Valentines Diner. I didn’t see anyone in there except Navajos and Pac Tour riders. It’s in pretty decrepit shape, but it is for sale. Four of us started lunch a little after 1:00 and were finishing up around 2:00 when Anurang said something about how late we would be getting in to Gallup. “And what if we ride like we usually do?” I asked. In fact, it took us just a little under three hours. Although we had to briefly get on the interstate again, most of our remaining miles were on frontage roads and Route 118 (into Gallup). 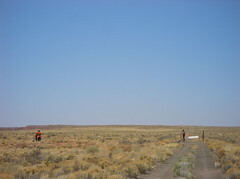 Shortly after leaving lunch, the landscape started to seem more like New Mexico to me, with pinon pines and grass. Although it hardly felt like it with the tailwind, we were climbing pretty much all day, and the temperature was cool when you stopped and could feel the wind. The sculpted cliffs on the side of the road were as impressive as I remembered from five years ago. We crossed the border into New Mexico and after passing many many motels and most of the town itself, found ourselves at the El Rancho. The rooms in this hotel aren’t that much bigger (or more modern) than a wigwam, but the lobby is spectacular (it kind of reminds me of Will Rogers’s house). Will Rogers probably stayed here, along with most of the other great old movie stars. The rooms are named much more impressively than the ones in Seligman, although I have to admit that I’d never heard of the person whose name adorns my door: Zachary Scott. I love the “crosswinds” photo in the previous post. Perfect with the horizontal windsock. The off-road riding looks awesome. Are you on a road bike? I was thinking so, but now I’m thinking it’s a mountain bike. How else could you ride those sandy roads? Don’t think about the office. Things have been positively boring. Even Pat, whose bearing the brunt of your absence, is twiddling his thumbs. Nope, it’s the same old Rivendell road bike. All I’ve done is add aerobars so I can rest my hands. I take it on fire roads at home fairly often, but I’m having to get re-used to the sand thing since I haven’t done that since I went on this trip five years ago.